How to Tell If Your Furnace Flame Sensor Is Bad. A Kansas City Tech Explains. Your furnace flame sensor is a safety feature that regulates the flow of gas coming into your furnace. Basically, it’s job is to shut off the gas valve if your gas burners don’t light. This prevents a dangerous buildup of raw gas in your home. If it stops working properly, it will shut down your furnace as a safety measure—meaning you’ll be left without heat mid-winter. Think your flame sensor might be going bad but not sure? We’ll explain those signs in more detail below. But first, let’s start by locating the flame sensor and explaining it’s job in more detail. Where is my furnace’s flame sensor and how does it work? Your furnace’s flame sensor is a short, thin metallic rod that’s either straight or slightly bent and sits inside your gas burner assembly. Its sole job is to sense whether the gas burners light to create a fire or not. Note: In order to visually inspect the flame sensor, you’ll need to remove the front access panel on your furnace. Depending on your furnace model, this panel may be held in place with several screws. During normal operation, once the thermostat calls for heat, your gas valve opens and shoots gas into the combustion chamber (where gas is burned to create heat). Then the pilot light or hot surface ignitor (depending on the kind of furnace you have) ignites the individual gas burners. 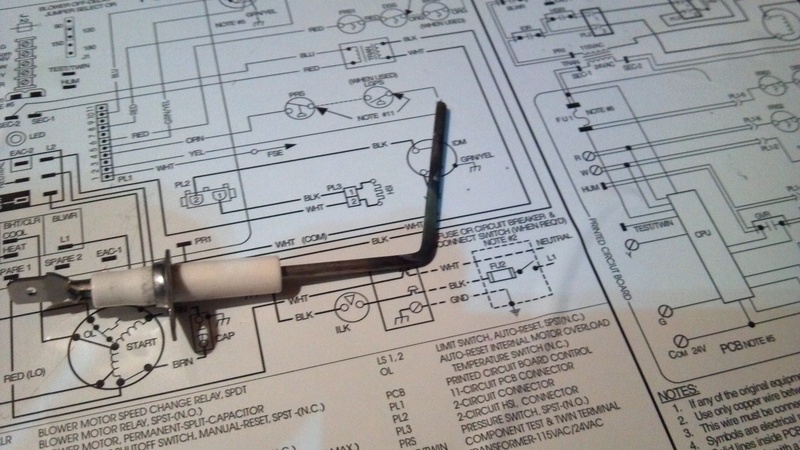 Your flame sensor’s job is simply to monitor whether there is actually a fire at the burner assembly. If the sensor doesn’t detect flames, it will shut off the gas valve to prevent raw gas from building up around the furnace. If it does sense a flame, it will allow gas to continually feed into the combustion chamber and create heat until your home reaches the desired temperature. 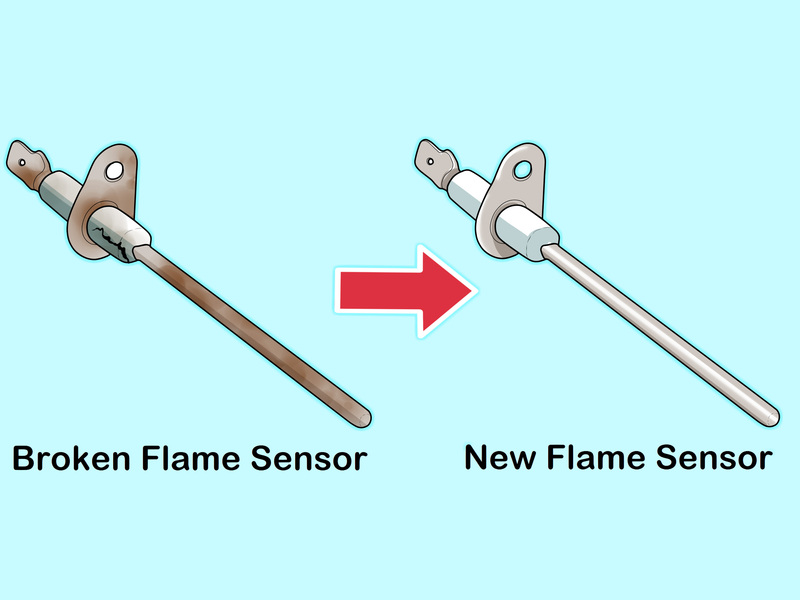 Sometimes, though, the flame sensor can go “bad” which means it won’t be able to detect a flame at the burner assembly even when there is one. Let’s look at some ways you can determine whether or not your flame sensor has gone bad. Need help now? Schedule your heating service here. If your flame sensor goes bad and can no longer sense the presence of a flame coming from your gas burners, it will shut off the gas valve immediately. That means you’ll hear the furnace kick on and you’ll see blue flames coming from your furnace burner assembly. But after 8 to 10 seconds, the burners shut off. Over time, soot from the gas burner’s flames can form on the tip of the flame sensor. That soot will eventually thicken and coat the sensor, preventing it from feeling heat from the burner flames. So if your flame sensor’s tip looks black, it most likely needs to be cleaned. Note: Because cleaning your flame sensor involves completely removing the sensor from your furnace, we suggest leaving this job to a professional. Your flame sensor is housed inside a porcelain casing. The porcelain acts as an insulator and prevents the sensor from grounding itself on your furnace’s metal bracket. But over time, that casing can crack due to heat. So, if that porcelain casing is cracked, you’ll need to have a professional replace it. Need help from a Kansas tech? If you live in Kansas and need a professional furnace repair, we can help. Just contact us and we’ll inspect your flame sensor for issues and repair or replace it if needed. Is a Furnace Inspection Worth It?